45th Gift Idea. 1970 DVD. What Happened in Year 1970.The most special 45th birthday gifts to receive and a pleasure to own is our 1970 DVD. It�s also the most tried-and-true of 45th anniversary gifts standouts. There�s no more thoughtful 45th birthday idea than demonstrating to your special someone what the world was like when they were born, what events were happening that their parents had to contend with as they welcomed their newborn into their family. It�s always interesting to look back and see our parents in a younger light. Help your particular person discover the world that helped shape them into the person you adore today! A generous 45th anniversary idea is helping your wonderful couple re-discover the world as it was when they were married and spent their first year wedded to each other. 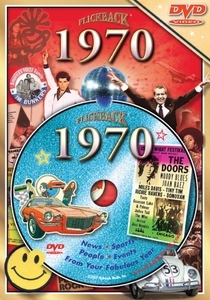 This interesting 1970 DVD filled with footage on sports, news, music, entertainment and a look at the humorous happenings of the year will reawaken those times and feelings! An even more fabulous 45th birthday idea, also a marvelous 45th anniversary idea, is playing our 1970 DVD at a party. But keep the remote handy as you�ll want to pause it again and again as your guests chime in with their own memories and at the laughs you�ll have at the way we looked back then! You�ll get a kick from just what news was reported & the way it was told! This fun and entertaining 1970 DVD runs 30 minutes. See also our other 45th birthday gifts.